How many Farmers Markets can offer shoppers a view like this? When The Oregonian recently enlisted readers to vote for their favorite Portland Metro Area Farmers Market, Lake Oswego’s came out on top. For regulars who already have May 14 circled on their calendars as opening day, it comes as no surprise. But for others who frequent popular spots like those in Beaverton and Portland State, they may be wondering what all the fuss is about. Variety. On average there are over 80 vendors each week offering everything from get-em-while-they’re-here Mt. Hood strawberries to artisan soap and hand roasted granola. In addition to produce you’ll find meats, eggs, honey, nuts, pasta, cheeses, artisan breads, jams and jellies and fresh seafood, not to mention flowers. In addition you’ll find it hard to resist breakfast burritos, made-on-the-spot donuts, wood fired pizza and Ethiopian stew. Keeping things fresh. The produce isn’t the only thing that’s fresh. Each year the market brings in new vendors to keep things interesting. This season’s newbies include: Bliss Nut Butter, Coco Lemmon (paleo and gluten-free sweet treats), For the Sake of Trees (ornamental and landscaping trees), Gabriel’s Bakery (French and Peruvian pastries, bagels, muffins and baked goods), Garcia’s Gourmet Salsa, Mountainside Herbal Nursery (edible herbs and starts), Purple Sun (acai bowls and smoothies), Slabtown Smokers (maple bourbon bacon), and the return of Country Grains (waffles, breakfast/lunch sandwiches and paninis). Kid Activities. The Lake Oswego Farmers Market is here to educate as well as entertain future shoppers. Kids ages 4-12, can check in at the Market Information Booth each week for the Farm Fresh Question of the Day. Correct answers are rewarded with a $2 market token, thanks to a grant from the Clackamas County Soil and Water Conservation District. Stop by early. The grant is for $2,000 so once that amount is given away, the program will be discontinued for the season. Kids can also enjoy games and crafts in the Kids’ Corner on the elevated stage. Local schools and organizations will be on hand to provide activities such as DIY projects to face painting. Entertainment. Music is food for the soul and the Lake Oswego Farmer’s Market provides that as well every Saturday from 10:30 a.m. to 12:30 p.m. under the pergola. There is sure to be something to suit everyone’s musical taste from Latin and Jazz to Hawaiian and Rock n’ Roll. Location. Few markets can claim a more picturesque setting than Lake Oswego’s. This is no parking lot you’re wedged in. The city opens its outdoor living room, Millennium Plaza Park, for this weekly event, allowing shoppers to take in a gorgeous lake view of Lakewood Bay. On a warm day, kids can cool off in the fountain located just steps below along State Street and day trippers can explore Lake Oswego’s downtown with popular restaurants and boutiques. (This Saturday they can also explore historic homes – see the announcement below). The Lake Oswego Farmers Market opens this Saturday, May 14 at 8:30 a.m. until closing at 1:30 p.m. The first 500 early birds won’t get the worm but they will get complimentary Farmers Market tote bags thanks to Lakeside Bicycles. Check out some recipes for putting your Farmers Market bounty to delicious use! I’ve put together a collection for you on Flipboard.com. Enjoy a tour of four historic Lake Oswego homes as well as two public sites, Luscher Farm and Belluschi Pavillion at Marylhust University this Saturday, May 14, between 11:00 a.m. and 4:00 p.m. Tickets are $25/Oswego Heritage Council Members; $30/Non-Members and available online. Summer is a great time to call Lake Oswego home. If you’re thinking of moving, give me a call at 503.939.9801 so we can get you into your new home in time to enjoy all that Lake Oswego has to offer! 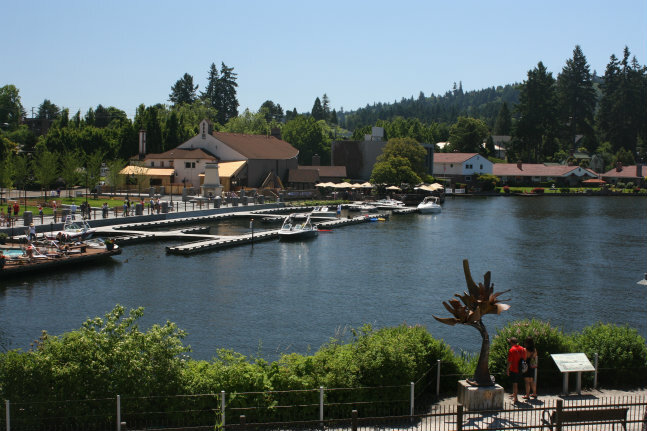 This entry was posted in Things to Do in Lake Oswego and tagged buying a home in Lake Oswego, Lake Oswego Farmers' Market, Lake Oswego Oregon, moving to Lake Oswego. Bookmark the permalink.